This entry was posted on May 12, 2016 by Jessica Anderson. We often get asked which trophies are appropriate for kids at a variety of ages. Read the guide below for suggestions for your young athlete. 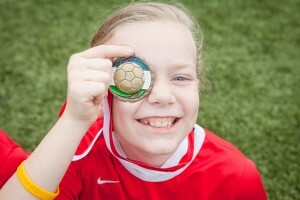 Medals make great participation awards for younger kids - fun to wear and easy to store! Youngsters - Ages 4-6: For your youngest players, go small. A sports figure attached to a base makes a great first trophy. Next Size Up - Ages 7-9: For kiddos in elementary school, a trophy with a small column is a great choice. Medals are also popular, as they are easy to store and can be clipped onto a backpack. Tweens - Ages 10-12: Resin trophies or larger column trophies are good awards for team accomplishments, such as playoff wins. Teens - 13+: Trophies and plaques are given to tournament winners, champions, or special honors, such as Team Captain, Most Inspirational, or MVP. Participation trophies are not usually given to older athletes. There's been much backlash in the news about participation trophies. As a mom, I get it, but I do see value in giving a small token of appreciation to younger players at the end of the season. Read my blog post on Participation Trophies for a fresh perspective.